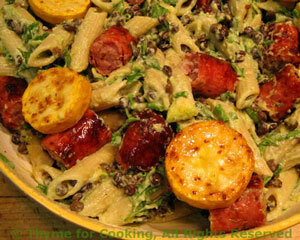 Pasta with Sausages and Lentils, Avocado Sauce, Weekly Menu Planner. I love avocado sauce on summer pastas. Made with soft goat cheese to add a bit of sharp definition, it accents the slight saltiness of the grilled sausages and the earthiness of the lentils. The lentils are left from Day 1. The goat cheese will be finished Day 6. Not quite a hot pasta dish; not quite a pasta salad. But chock-a-block with vegetables and flavor. Can easily be made vegetarian: eliminate the sausages and add more zucchini, lentils (cooked in water) or tofu. Briefly inspect the lentils in case someone missed the odd stone. Rinse and drain. Cook the lentils in water and/or stock, about 25 minutes / according to package directions or until done. When done, remove from heat and drain if needed. Cut avocado and remove pit. Put both halves of the avocado into a small bowl. Add lemon juice and mash with a fork or potato masher. When well mashed add goat cheese and mash together. Slice into 1/2" (1.25cm) thick slices. Heat oil in a nonstick skillet over medium heat. The skillet needs to be large enough to hold all of the slices flat. Add zucchini slices and fry 8 - 12 minutes. Check after 8 by lifting up with tongs and looking at the bottom; it should be getting brown spots on it. If not, fry some more; if yes turn and fry the other side. The other side won't take quite as long. When they are done the slices will have nice, browned patches on both sides and be tender. Cook on barbecue grill 10 - 15 minutes or until done (can also be sautéed in nonstick skillet - same amount of time). When pasta is done put it into a large bowl with lentils and herbs. Add mashed avocado/chevre and toss well to combine. When sausages are done, remove and slice in 1 inch (2.5cm) lengths. Add to pasta and toss well to combine. Lay zucchini slices on top and serve.